One of the deadliest natural disasters in history unfolded on December 26, 2004, when a great undersea earthquake with a magnitude between 9.0-9.3 triggered a tsunami that devastated many coastal areas of the Indian ocean, killing an estimated 283,000 people. The tsunami devastated large parts of coastal Indonesia such as Banda Aceh, then swept across islands in the Indian ocean to strike Sri Lanka, India, and east Africa. The tsunami propagated into all of the world's oceans where it was locally amplified by local coastal effects, but generally did little damage outside the Indian ocean. The Indian ocean was not equipped with any tsunami warning system, so the wave successively surprised coastal residents and tourists visiting many beach resorts. If there had been even a simple warning system in place, then tens of thousands of lives may have been saved. Nations of the Indian ocean have since invested in a tsunami warning system in order to prepare for future disasters. Examination of historical tsunami events reveals that most are caused by large undersea earthquakes, since they displace vast amounts of water and can form waves that travel great distances before they dissipate. Undersea volcanic eruptions or collapse of calderas along the coast have also formed historical deadly tsunamis, with the most famous examples being the eruptions of Krakatau and Tambora in Indonesia. Volcanic-eruption-induced tsunamis can form large waves, but since they displace less water than earthquake-induced tsunamis, the waves dissipate faster than those from earthquakes. Giant landslides around volcanic islands and along continental margins have also generated large tsunamis in the historical and geological records. See also beaches and shorelines; earthquakes; geological hazards; plate tectonics; tsunamis, generation mechanisms. Booth, J. S., D. W. O'Leary, P. Popencoe, and W. W. Dan-forth. "U.S. Atlantic Continental Slope Landslides: Their Distribution, General Attributes, and Implications." United States Geological Survey Bulletin 2002, 1993: 14-22. Driscoll, N. W., J. K. Weissel, and J. A. Goff. "Potential for Large-Scale Submarine Slope Failure and Tsunami Generation along the United States' Mid-Atlantic Coast." Geology 28 (2000): 407-410. Dvorak, J., and T. Peek. "Swept Away." Earth 2, no. 4 (1993): 52-59. York: Facts On File, 2008. Latter, J. H. "Tsunami of Volcanic Origin: Summary of Causes, with Particular Reference to Krakatau, 1883." Journal of Volcanology 44 (1981): 467-490. McCoy, F., and G. Heiken. "Tsunami Generated by the Late Bronze Age Eruption of Thera (Santorini), Greece." Pure and Applied Geophysics 157 (2000): 1,227-1,256. Minoura, K., F. Inamura, T. Nakamura, A. Papadopou-los, T. Takahashi, and A. Yalciner. "Discovery of Minoan Tsunami Deposits." Geology 28 (2000): 59-62. Revkin, A. C. "Tidal Waves Called Threat to East Coast." The New York Times (2000): A18. Tsunamis.com. Available online. URL: http://www.tsuna-mis.com/tsunami-pictures.html Accessed January 26, 2009.
unconformities An unconformity is a substantial break or gap in a stratigraphic sequence that marks the absence of part of the rock record. These breaks may result from tectonic activity with uplift and erosion of the land, sea level changes, climate changes, or simple hiatuses in deposition. Unconformities normally imply that part of the stratigraphic sequence has been eroded but may also indicate that part of the sequence was not ever deposited in that location. There are several different types of unconformities. Angular unconformities are angular discordances between older and younger rocks. Angular unconformities form in places where older layers were deformed and partly eroded before the younger layers were deposited. 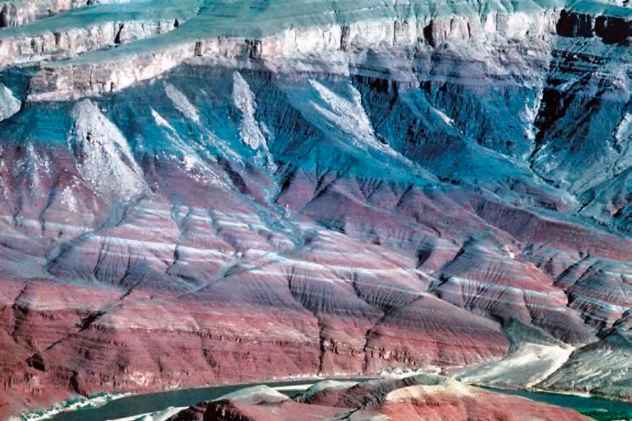 Disconformities represent a significant erosion interval between parallel strata. They are typically recognized by their irregular surfaces, missing strata, or large breaks between dated strata. Nonconformities are surfaces where strata overlie igneous or metamorphic rocks. Unconformities are significant in that they record an unusual event, such as tectonism, erosion, sea level change, or climate change. unconformities are typically overlain by a pro-gradational marine sequence, starting with shallow water sandstone, conglomerate or quartzite, and succeeded by progressively deeper water deposits such as sandstone, shale, and limestone. unconformities are often used by stratigraphers and other geologists to separate different packages of rocks deposited during different tectonic, climatic, or time systems. See also historical geology; plate tectonics; stratigraphy, stratification, cyclothem. Prothero, Donald, and Robert Dott. Evolution of the Earth. 6th ed. New York: McGraw-Hill, 2002.
universe The universe includes all matter and energy everywhere, including the Earth, solar system, galaxies, interstellar matter and space, regarded as a whole. The large-scale structure of the universe refers to mapping and characterization of the observable distributions of matter, light, and space, on scales of billions of light-years. Sky surveys from Earth and space-based observation platforms using a wide range of the electromagnetic spectrum have been used to determine what is presently known about the large scale structure of the universe and the types of matter and energy contained within the cosmos. Astronomers have been able to determine that there is a hierarchal organization to the universe, with matter organized into progressively larger structures from atoms, to solar systems, to galaxies, to clusters and superclusters, to filaments, then a continued structure known as the End of Greatness. The small-scale structure of matter and energy in the universe includes many scales of observation, ranging from subatomic particles, through stellar and solar system scales, and through the galactic scales. The large-scale structure begins at the galactic scale. Galaxies are gravitationally-bound assemblages of stars, dust, gas, radiation, and dark matter. Most contain vast numbers of star systems and are located at enormous distances from the Milky Way Galaxy, such that the light reaching Earth from these galaxies was generated billions of years ago. Galaxies are classified into four basic types including spiral galaxies, barred spiral galaxies, elliptical galaxies, and irregular galaxies. Galaxies are organized into clusters and super-clusters held together by their mutual gravitational attraction. These groups or clusters are separated by voids characterized by relatively empty space that is apparently devoid of luminous matter. The Milky Way Galaxy is part of the Local Group, which also includes the large Andromeda spiral Galaxy, the Large and Small Magellanic Clouds, and about 20 smaller galaxies. Galaxy clusters are of several different types. Regular clusters are spherical with a dense central core and are classified based on how many galaxies reside within 1.5 megaparsecs of the cluster center. Most regular clusters have a radius between one and 10 megaparsecs and masses of 1015 solar masses. Irregular clusters generally have slightly lower mass (~1012-1014 solar masses) than regular clusters and have no well-defined center. An example of an irregular cluster is the Virgo Cluster. Galaxies and galaxy clusters are further grouped into even larger structures. Superclusters typically consist of groups or chains of clusters with masses of about 1016 solar masses. The Milky Way Galaxy is part of one supercluster, centered on the Virgo Cluster, and has a size of about 15 megaparsecs. In contrast, the largest known superclusters, like that associated with the Coma Cluster, are about 100 megaparsecs across. Recent advances in astronomers' ability to map the distribution of matter in space reveal that about 90 percent of all galaxies are located within a network of superclusters that permeates the known universe. The motions of galaxies show patterns on different scales of observation. The motion of individual galaxies within clusters of galaxies appears random, but the clusters show some very ordered patterns to their motions at some of the largest scales of observation in the universe. Every known galaxy shows a redshifted spectrum, meaning they are all moving away from the Earth, in all directions. Individual galaxies that are not in clusters are moving away, as are the groups of galaxies in clusters, even though they have some random motions within the clusters. The farther away the galaxy or cluster is from Earth, the greater the redshift, and the faster it is receding. The same is true for other observational pairs—the farther apart any two galaxies or clusters are, the greater the redshift between them, showing that the entire universe is expanding like the surface of an inflating balloon. Before 1989 astronomers thought that superclu-sters were the largest-scale structures in the universe. However, in 1989 a survey of redshifts by American astronomers Margaret Geller (Smithsonian Astro-physical Observatory) and John Huchra (Harvard-Smithsonian Center for Astrophysics) discovered a larger-scale structure dubbed "The Great Wall," consisting of an organized sheet of galaxies that is more than 500 million light-years long and 200 million light-years wide, yet only 15 million light-years thick. In 2003 another similar but larger sheet of galaxies, the "Sloan Great Wall," was discovered by Princeton University astronomers J. Richard Gott III and Mario Juric. This wall is 1.37 billion light-years long. Sometimes there can be organization to emptiness. Much of the large-scale structure of the universe looks like a bubble-bath with sheets and walls of galaxies surrounding voids inside the bubbles. one of the largest known voids is the Capricornus Void, with a diameter larger than 230 million light-years. There appears to also be a hierarchal organization to voids that is only recently being observed and understood. In 2007 a possible supervoid was mapped in the constellation Eridanus by the Wilkinson Microwave Anisotropy Probe (WMAP), corresponding to the WMAP Cold Spot, a region that is cold in microwave wavelengths. The Eridanus Supervoid is about 500 million to 1 billion light-years across, making it one of the largest known structures in the universe. Mapping the cosmic microwave background radiation, distribution of matter, energy, and light shows an overall bubble-like distribution of voids throughout the universe, separated by many sheets and filaments (string-like clusters between bubblelike voids) of galaxies, with superclusters appearing as very dense nodes, in some ways corresponding to places where three of the bubble-like voids would meet. The "End of Greatness" proposes an even larger-scale structure to the universe at observational scales of about 300 million light-years (100 Mpc). At this scale, the lumpiness in the distribution of superclu-sters, the walls and filaments, and distribution of voids and supervoids all become homogenous (equal density of mass) and isotropic (similar in every direction). This largest-scale organization of the universe is consistent with models of the big bang and the inexorable expansion of the universe. See also astronomy; astrophysics; constellation; cosmic microwave background radiation; cosmology; dark matter; electromagnetic spectrum; galaxies; galaxy clusters; Hubble, Edwin; interstellar medium; origin and evolution of the universe. York: W. H. Freeman, 2008. National Aeronautics and Space Administration. "Universe 101, Our Universe, Big Bang Theory. 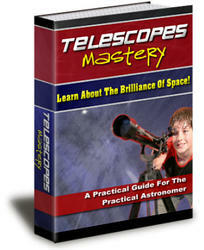 Cosmology: The Study of the Universe" Web page. Available online. URL: http://map.gsfc.nasa.gov/universe/. Last updated May 8, 2008. Snow, Theodore P. Essentials of the Dynamic Universe: An Introduction to Astronomy. 4th ed. St. Paul, Minn.: West Publishing Company, 1991. The 2dF Galaxy Redshift Survey. A Map of the Universe. Available online. URL: http://www2.aao.gov. au/~TDFgg/. Accessed January 13, 2009. Uranus The seventh planet from the Sun, Uranus is a giant gaseous sphere with a mass 15 times that of the Earth and a diameter four times as large as Earth's (51,100 km). The equatorial plane is circled by a system of rings, some associated with the smaller of the 15 known moons circling the planet. Uranus orbits the Sun at a distance of 19.2 astronomical units (Earth-Sun distance) with a period of 84 Earth years and has a retrograde rotation of 0.69 Earth days. Its density is only 1.2 grams per cubic centimeter, compared to the Earth's average density of 5.5 grams per cubic centimeter. The density is higher, however, than Jupiter's or Saturn's, suggesting that Uranus has a proportionally larger rocky core than either one of these giant gaseous planets. would first observe the distant Sun rising above the horizon and tracing out part of a circular path, then sinking below the horizon. Eventually the Sun would finally emerge totally and trace out complete circle paths every 17 hours. The position of the Sun would progressively change over the next 42 years until it sank below the horizon for the following 42 years. The atmosphere of Uranus is roughly similar to Jupiter's and Saturn's, consisting mostly of molecular hydrogen (84 percent), helium (14 percent), and methane (2 percent). Ammonia seems to be largely absent from the atmosphere of uranus, part of a trend that has ammonia decreasing in abundance outward in the outer solar system, with less at lower temperatures. The reason is that ammonia freezes into ammonia ice crystals at -335°F (70 K), and Jupiter's and Saturn's upper atmospheres are warmer than this, whereas Uranus's is -355°F (58 K). Any ammonia therefore would have crystallized and fallen to the surface. The atmosphere of Uranus appears a blue-green color because of the amount of methane, but so far relatively few weather systems have been detected on the planet. Enhancement of imagery however has revealed that the atmosphere is characterized by winds that are blowing around the planet at 125 to 310 miles per hour (200-500 km/hr) in the same sense as the planet's rotation, with detectable channeling of the winds into bands. The winds are responsible for transporting heat from the warm to the cold hemisphere during the long winter months. The magnetic field of Uranus is surprisingly strong, about 100 times as strong as the Earth's. However, since the rocky core of the planet is so far below the cloud level the strength of the magnetic field at the cloud tops on Uranus is actually similar to that on the surface of the Earth. Like the rotational axis, the orientation of the magnetic poles and field on Uranus are highly unusual. The magnetic axis is tilted at about 60° from the spin axis, and is not centered on the core of the planet, but is displaced about one-third of the planetary radius from the planet's center. The origin of these unusual magnetic field properties is not well understood, but may be related to a slurry of electrically conducting ammonia clouds near the planet's rocky surface. Whatever the cause, a similar unusual field exists on nearby Neptune. Uranus has 15 known large moons with diameters of more than 25 miles (40 km), orbiting between 31,070 miles (50,000 km) from the planet (for the smallest moon) to 362,260 miles (583,000 km) for the largest moon. From largest to smallest, these moons include Oberon, Titania, Umbriel, Ariel, Miranda, Puck, Belinda, Rosalind, Portia, Juliet, Desdemona, Cressida, Bianca, Ophelia, and Cordelia. The 10 smallest moons all orbit inside the orbit of Miranda and are associated with the ring system around Uranus, and all of the moons rotate in the planet's equatorial plane, not the ecliptic of the solar system. Most of these moons are relatively dark, heavily cratered, and geologically inactive bodies, with the exception of Miranda, which shows a series of ridges, valleys, and different morphological terrains. One of the most unusual is a series of oval wrinkled or faulted terrains of uncertain origin, but perhaps related to subsurface magmatism, impacts, or volcanism. The ring system around Uranus was only discovered recently, in 1977, when the planet passed in front of a bright star and the rings were observed by astronomers studying the planet's atmosphere. There are nine known rings between 27,340 and 31,690 miles (44,000-51,000 km) from the planet's center, and each of these rings appears to be made of many much smaller rings. The rings are generally dark and narrow with widths of up to six miles (10 km), with wide spaces between the main rings ranging from 125-620 miles (200-1,000 km). The rings are only a few tens of meters thick. Most of the particles that make up the rings are dust- to boulder-sized, dark-colored, and trapped in place by the gravitational forces between Uranus and its many moons. See also Earth; Jupiter; Mars; Mercury; Neptune; Saturn; solar system; Venus. York: W. H. Freeman, 2008. National Aeronautic and Space Administration. Solar System Exploration page. "Uranus." Available online. 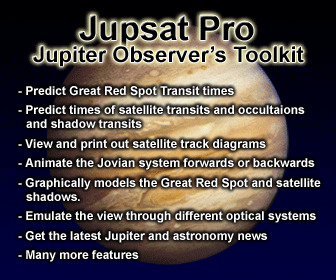 URL: http://solarsystem.nasa.gov/planets/profile. cfm?Object=Uranus. Last updated June 25, 2008. Snow, Theodore P. Essentials of the Dynamic Universe: An Introduction to Astronomy. 4th ed. St. Paul, Minn.: West Publishing Company, 1991. 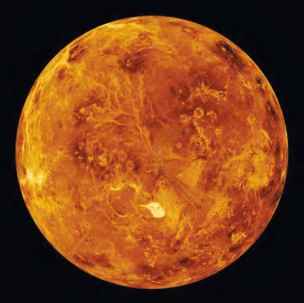 Venus The second planet from the Sun, Venus is the planet in our solar system that most closely resembles Earth, with a planetary radius of 3,761 miles (6,053 km), or 95 percent of the Earth's radius. Venus orbits the Sun in a nearly circular path at 0.72 astronomical units (Earth-Sun distance) and has a mass equal to 81 percent of Earth's and density of 5.2 grams per cubic centimeter, very similar to Earth's 5.5 grams per cubic centimeter. The orbital period (year) of Venus is 0.62 Earth years, but it has a retrograde rotation about its axis of 243 days, with its north pole turned essentially upside down so that its equatorial pole is inclined at 177.4° from the orbital plane. One result of this tilt and the slow retrograde rotation is that the two effects combine to make each day on Venus take the equivalent of 117 Earth days. Another effect is that the slow rotation has not set up a geodynamo current in the planet's core, so Venus has no detectable magnetic field. Thus, it lacks a magnetosphere to protect it from the solar wind, so it is constantly bombarded by high-energy particles from the Sun. These particles lead to constant ioniza-tion of the upper levels of the atmosphere. Venus is usually one of the brightest objects in the sky (excepting the Sun and Moon), and is usually visible just before sunrise or just after sunset, since its orbit is close to the Sun. The atmosphere of Venus is very dense, is composed mostly (96.5 percent) of carbon dioxide, and is nearly opaque to visible radiation, so most observations of the planet's surface are based on radar reflectivity. Spacecraft and Earth-based observations of Venus show that the atmospheric and cloud patterns on the planet are more visible in ultraviolet (UV) wavelengths, since some of the outer clouds seem to be made of mostly sulfuric acid, which absorbs uV radiation, whereas other clouds reflect this wavelength, producing a highly contrasted image. These observations show that the atmosphere contains many large clouds moving around 250 miles per hour (400 km/hr) that rotate around the planet on average once every four days. The atmospheric patterns on Venus resemble the jet stream systems on Earth. Aside from carbon dioxide, the atmosphere contains nitrogen plus minor or trace amounts of water vapor, carbon monoxide, sulfur dioxide, and argon. Although many basic physical Venusian properties are similar to Earth's, the atmosphere on Venus is about 90 times more massive and extends to much greater heights than Earth's atmosphere. The mass of the Venusian atmosphere causes pressures to be exceedingly high at the surface, a value of 90 bars, compared to Earth's one bar. The troposphere, or region in which the weather occurs, extends to approximately 62 miles (100 km) above the surface. The upper layers of the Venusian atmosphere, from about 75-45 miles (120-70 km) height, are composed of sulfuric acid cloud layers, underlain by a mixing zone that is underlain by a layer of sulfu-ric acid haze from 30-20 miles (50-30 km). Below about 18 miles (30 km) the air is clear. dissimilarly under high temperatures and pressures, and heat flow from the interior is buffered with a drastically different surface temperature. Earth and Venus had essentially the same amounts of gaseous carbon dioxide, nitrogen, and water in their atmospheres soon after the planets formed. However, since Venus is closer to the Sun (it is 72 percent of the distance from the Sun that Earth is) it receives about two times as much solar radiation as the Earth, which is enough to prevent the oceans from condensing from vapor. Without oceans, carbon dioxide did not dissolve in seawater or combine with other ions to form carbonates, so the C02 and water stayed in the atmosphere. Because the water vapor was lighter than the Co2, it rose to high atmospheric levels and was dissociated into hydrogen (H) and oxygen (O) ions; the hydrogen escaped to space, whereas the oxygen combined with other ions. Thus, oceans never formed on Venus, and the water that could have formed them dissociated and is lost in space. Earth is only slightly further from the Sun, but conditions here are exactly balanced to allow water to condense and the atmosphere to remain near the equilibrium (triple) point of solid, liquid, and vapor water. These conditions allowed life to develop on Earth, and life further modified the atmosphere-ocean system to maintain its ability to support further life. Venus never had a chance. With Venus's thick atmosphere, the surface must be mapped with cloud-penetrating radar from Earth and spacecraft. The surface shows many remarkable features, including a division into a bimodal crustal elevation distribution reminiscent of Earth's continents and oceans. Most of the planet is topographically low, including about 27 percent flat volcanic lowlands and about 65 percent relatively flat plains, probably basaltic in composition, surrounded by volcanic flows. The plains are punctuated by thousands of volcanic structures, including volcanoes and elongate narrow flows, including one that stretches 4,225 miles (6,800 km) across the surface. Some of the volcanoes are huge, with more than 1,500 having diameters of more than 13 miles (20 km), and one (Sapas Mons) more than 250 miles (400 km) across and almost one mile (1.5 km) high. About 8 percent of the planet consists of highlands made of elevated plateaus and mountain ranges. The largest continentlike elevated landmasses include the Australian-sized Ishtar Terra in the southern hemisphere, and Africa-sized Aphrodite Terra in equatorial regions. Ishtar Terra has interior plains rimmed by what appear to be folded mountain chains and Venus's tallest mountain, Maxwell Mons, reaching 7 miles (11 km) in height above surrounding plains. Aphrodite Terra also has large areas of linear folded mountain ranges, many lava flows, and some fissures that probably formed from lava upwelling from crustal magma chambers, then collapsing back into the chamber instead of erupting. The surface of Venus preserves numerous impact structures and unusual circular to oval structures and craters that are most likely volcanic in origin. Some of the most unusual-appearing are a series of rounded pancake-like bulges that overlap each other on a small northern hemisphere elevated terrane named Alpha Regio. These domes are about 15.5 miles (25 km) across and probably represent lava domes that filled, then had the magma withdrawn from them, forming a flat, cracked lava skin on the surface. There are many basaltic shield volcanoes scattered about the surface and some huge volcanic structures known as coronae. These are hundreds of kilometers across and are characterized by a series of circular fractures reflecting a broad upwarped dome, probably formed as a result of a plume from below. Many volcanoes dot the surface in and around coro-nae, and lava flows emanate and flow outward from some of them. Impact craters are known from many regions on Venus, but their abundance is much less than expected for a planet that has had no changes to its surface since formation. No impacts less than two miles (3 km) across are known since small meteorites burn up in the thick atmosphere before hitting the surface. The paucity of other larger impacts reflects the fact that the surface has been reworked and plated by basalt in the recent history of the planet, as confirmed by the abundant volcanoes, lava flows, and the atmospheric composition of the planet. It is likely that volcanism is still active on Venus. Many of the surface features on Venus indicate some crustal movements. For instance, the folded mountain ranges show dramatic evidence of crustal shortening, and there are many regions of parallel fractures. Despite these features, there have not been any features found that are indicative of plate tectonic types of processes operating. Most of the structures could be produced by crustal downsagging or convergence between rising convective plumes, in a manner similar to that postulated for the early Earth before plate tectonics was recognized. See also Earth; Jupiter; Mars; Mercury; Neptune; Saturn; solar system; Uranus. York: W. H. Freeman, 2008. National Aeronautic and Space Administration. Solar System Exploration Page. Venus. Available online. URL: http://solarsystem.nasa.gov/planets/profile. cfm?Object=Venus. Last updated May 7, 2008. Snow, Theodore P. Essentials of the Dynamic Universe: An Introduction to Astronomy. 4th ed. St. Paul, Minn.: West Publishing Company, 1991.
volcano A volcano is a mountain or other constructive landform built by a singular volcanic eruption or a sequence of eruptions of molten lava and pyroclastic material from a volcanic vent. Volcanoes have many forms, ranging from simple vents in the Earth's surface, through elongate fissures that erupt magma, to tall mountains with volcanic vents near their peaks. Volcanic landforms and landscapes are as varied as the volcanic rocks and eruptions that produce them. Volcanic eruptions provide one of the most spectacular of all natural phenomena, yet they also rank among the most dangerous of geological hazards. More than 500 million people worldwide live near active volcanoes and need to understand the risk associated with volcanic eruptions and how to respond in the event of volcanic emergencies. Eruptions may send blocks of rock, ash, and gas tens of thousands of feet into the atmosphere in beautiful eruption plumes, yet individual eruptions have also killed tens of thousands of people. The hazards associated with volcanic eruptions are not limited to the immediate threat from the flowing lava and ash, but include longer-term atmospheric and climate effects and changes to land-use patterns and the livelihood of human populations. People have been awed by the power and fury of volcanoes for thousands of years, as evidenced by biblical passages referring to eruptions, and more recently by the destruction of Pompeii and Hercu-laneum by the eruption of Italy's Mount Vesuvius in the year 79 c.e. Sixteen thousand people died in Pompeii alone, buried by a fast-moving hot incandescent ash flow known as a nuée ardente. This famous eruption buried Pompeii in thick ash that quickly solidified and preserved the city and its inhabitants remarkably well. In the 16th century Pompeii was rediscovered and has since then been the focus of archeological investigations. Mount Vesuvius is still active, looming over the present-day city of Naples, Italy. Most residents of Naples rarely think about the threat looming over their city. There are many apparently dormant volcanoes similar to Vesuvius around the world, and people who live near these volcanoes need to understand the potential threats and hazards posed by these sleeping giants to know how to react in the event of a major eruption from the volcanoes. Most volcanic eruptions on the planet are associated with the boundaries of tectonic plates. 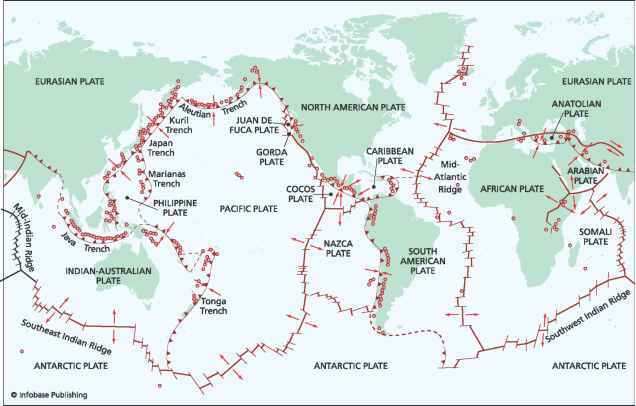 Extensional or divergent plate boundaries where plates are being pulled apart, such as along the mid-ocean ridges, have the greatest volume of magma erupted each year for any volcanic province on the Earth. However, these eruptions are not generally hazardous, especially since most of these eruptions occur many miles (km) below sea level. A few exceptions to this rule are noted where the mid-ocean ridges rise above sea level, such as in Iceland. There, volcanoes including the famous Hekla volcano have caused significant damage. Hekla has even erupted beneath a glacier, causing instant melting and generating fast-moving catastrophic floods called Jokulhlaups. Despite these hazards, Icelanders have learned to benefit from living in a volcanically active area, tapping a large amount of heat in geothermal power-generating systems. Larger volcanoes are associated with extensional plate boundaries located in continents. For instance, the East African rift system is where the African continent is being ripped apart, and it hosts some spectacular volcanic cones, including Kilimanjaro, Ol Doinyo Lengai, Nyiragongo, and many others. belt, including Mount Saint Helens in Washington State, typically have violent explosive eruptions that have killed many people and altered the landscape over wide regions. An unusual style of volcanic activity is not associated with plate boundaries, but forms large broad volcanic shields in the interior of plates. These volcanoes typically have spectacular but not extremely explosive volcanic eruptions. 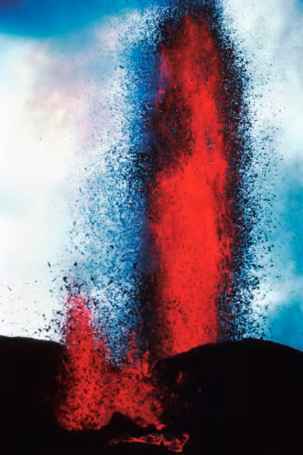 The most famous of these "intraplate" volcanoes is Mauna Loa on Hawaii. Hazards associated with these volcanoes include lava flows and traffic jams from tourists trying to see the flows. The style of volcanic eruptions varies tremendously, both between volcanoes and from a single volcano during the course of an eruptive phase. This variety is related to the different types of magma produced by the different mechanisms described above. Geologists have found it useful to classify volcanic eruptions based on how explosive the eruption was, on which materials erupted, and by the type of landform produced by the volcanic eruption. Tephra is material that comes out of a volcano during an eruption, and it may be thrown through the air or transported over the land as part of a hot moving flow. Tephra includes both new magma from the volcano and older broken rock fragments caught during the eruption. It includes ash and pyroclasts, rocks ejected by the volcano. Large pyroclasts are called volcanic bombs; smaller fragments are lapilli, and the smallest grade into ash. While the most famous volcanic eruptions produce huge explosions, many eruptions are relatively quiet and nonexplosive. Nonexplosive eruptions have magma types that have low amounts of dissolved gases, and they tend to be basaltic in composition. Basalt flows easily and for long distances and tends not to have difficulty flowing out of volcanic necks. Nonexplosive eruptions may still be spectacular, as any visitor to Hawaii lucky enough to witness the fury of Pele, the Hawaiian goddess of the volcano, can testify. Mauna Loa, Kilauea, and other nonexplosive volcanoes produce a variety of eruption styles, including fast-moving flows and liquid rivers of lava, lava fountains that spew fingers of lava trailing streamers of light hundreds of feet into the air, and thick sticky lava flows that gradually creep downhill. The Hawaiians devised clever names for these flows, including aas for blocky rubble flows because walking across these flows in bare feet makes one exclaim "ah, ah" in pain. Pahoehoes are ropy-textured flows, after the Hawaiian term for rope. Explosive volcanic eruptions are among the most dramatic of natural events on Earth. With little warning, long-dormant volcanoes can explode with the force of hundreds of atomic bombs, pulverizing whole mountains and sending the existing material together with millions of tons of ash into the stratosphere. Explosive volcanic eruptions tend to be associated with volcanoes that produce andesitic or rhyolitic magma and have high contents of dissolved gases. These are mostly associated with convergent plate boundaries. Volcanoes that erupt magma with high contents of dissolved gases often produce a distinctive type of volcanic rock known as pumice, which is full of bubble holes, in some cases making the rock light enough to float on water. miles (45 km) in height, and they spew hot turbulent mixtures of ash, gas, and tephra into the atmosphere where winds may disperse them around the planet. Large ashfalls and tephra deposits may be spread across thousands of square miles (km2). These explosive volcanoes also produce one of the scariest and most dangerous clouds on the planet. Nuées ardentes are hot glowing clouds of dense gas and ash that may reach temperatures of nearly 1,830°F (1,000°C), rush down volcanic flanks at 450 miles per hour (700 km/h), and travel more than 60 miles (100 km) from the volcanic vent. Nuées ardentes have been the nemesis of many a volcanologist and curious observer, as well as thousands upon thousands of unsuspecting or trusting villagers. Nuées ardentes are but one type of pyroclastic flow, which include a variety of mixtures of volcanic blocks, ash, gas, and lapilli that produce volcanic rocks called ignimbrites. Most volcanic eruptions emanate from the central vents at the top of volcanic cones. However, many other flank eruptions have been recorded, where eruptions blast out of fissures on the side of the volcano. occasionally volcanoes blow out their sides, forming a lateral blast like the one that initiated the 1980 eruption of mount saint helens in the state of Washington. This blast was so forceful that it began at the speed of sound, killing everything in the initial blast zone. Volcanic landforms and landscapes are wonderful, dreadful, beautiful, and barren. They are as varied as the volcanic rocks and eruptions that produce them. shield volcanoes include the largest and broadest mountains on the planet (mauna Loa is more than 100 times as large as mount Everest). These have slopes of only a few degrees, produced by basaltic lavas that flow long distances before cooling and solidifying. stratovolcanoes, in contrast, are the familiar steep-sided cones like mount Fuji, made of stickier lavas such as andesites and rhyolites, and they may have slopes of 30°. other volcanic constructs include cinder or tephra cones, including the san Francisco Peaks in Arizona, which are loose piles of cinder and tephra. Calderas, like Crater Lake in oregon, are huge circular depressions, often many miles (km) in diameter, that are produced when deep magma chambers under a volcano empty out (during an eruption). such eruptions form huge empty spaces below the surface, and the overlying land collapses inward producing a topographic depression known as a caldera. Yellowstone Valley occupies one of the largest calderas in the united states. many geysers, hot springs, and fumaroles in the valley are related to groundwater circulating to depths, being heated by shallow magma, and mixing with volcanic gases that escape through minor cracks in the crust of the Earth. Diagram labeling parts of eruption column that may form catastrophic flows. 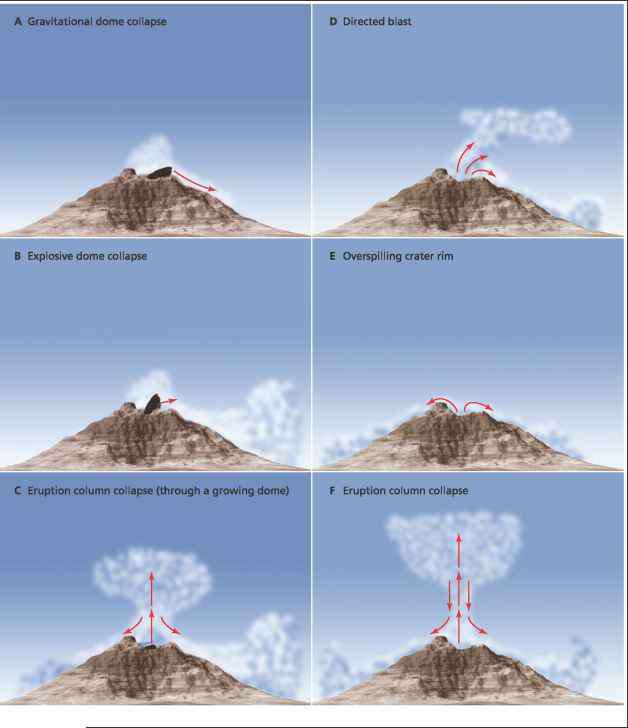 (A) gravitational dome collapse; (B) explosive dome collapse; (C) eruption column collapse blasted through a growing dome; (D) directed blast, with Mount St. Helens as a recent example; (E) eruption overspilling crater rim; (F) eruption column collapse. If continuous this produces large volume deposits, and if discontinuous from discrete explosions, the deposits are smaller. The types of volcanism and associated volcanic hazards differ in various tectonic settings because each tectonic setting produces a different type of magma, through the processes described above. Mid-ocean ridges and intraplate hot-spot types of volcanoes typically produce nonexplosive eruptions, whereas convergent tectonic margin volcanoes may produce tremendously explosive and destructive eruptions. Much of the variability in the eruption style may be related to the different types of magma produced in these different settings and also to the amount of dissolved gases, or volatiles, in these magmas. Magmas with large amounts of volatiles tend to be highly explosive, whereas magmas with low contents of dissolved volatiles tend to be nonexplosive. The difference is very much like shaking two bottles, one containing soda and one containing water. The soda contains a high concentration of dissolved volatiles (carbon dioxide) and explodes when opened. In contrast, the water has a low concentration of dissolved volatiles and does not explode when opened. Eruptions from mid-ocean ridges are mainly basaltic flows, with low amounts of dissolved gases. These eruptions are relatively quiet, with basaltic magma flowing in underwater tubes and breaking off in bulbous shapes called pillow lavas. The eruption style in these underwater volcanoes is analogous to toothpaste being squeezed out of a tube. Eruptions from mid-ocean ridges may be observed in the few rare places where the ridges emerge above sea level, such as Iceland. Eruptions there include lava fountaining, where basaltic cinders are thrown a few hundred feet in the air and accumulate as cones of black glassy fragments, and they also include long stream-like flows of basalt. Hot-spot volcanism tends to be much like that at mid-ocean ridges, particularly where the hot spots are located in the middle of oceanic plates. The Hawaiian Islands are the most famous hot-spot type of volcano in the world, with the active volcanoes on the island of Hawaii known as Kilauea and Mauna Loa. Mauna Loa is a huge shield volcano, characterized by a very gentle slope of a few degrees from the base to the top. This gentle slope is produced by lava flows that have a very low viscosity (meaning they flow easily) and can flow and thin out over large distances before they solidify. Magmas with high viscosity would be much stickier and would solidify in short distances, producing volcanoes with steep slopes. Measured from its base on the Pacific Ocean seafloor to its summit, Mauna Loa is the tallest mountain in the world, a fact attributed to the large distances that its low-viscosity lavas flow and to the large volume of magma produced by this hot-spot volcano. Volcanoes associated with convergent plate boundaries produce by far the most violent and destructive eruptions. Recent convergent margin eruptions include Mount Saint Helens and two volcanoes in the Philippines, Mount Pinatubo and Mayon volcano. The magmas from these volcanoes tend to be much more viscous, are higher in silica content, and have the highest concentration of dissolved gas-ses. Many of the dissolved gasses and volatiles, such as water, are released from the subducting oceanic plate as high mantle temperatures heat it up as it slides beneath the convergent margin volcanoes. Volcanic eruptions have been responsible for the deaths of hundreds of thousands of people, and they directly affect large portions of the world's population, land-use patterns, and climate. The worst volcanic disasters have killed tens of thousands of people, whereas others may kill only a few thousand, hundreds, or even none. The following sections discuss specific phenomena associated with volcanic eruptions that have been responsible for the greatest loss of life in individual eruptions. Understanding the hazards associated with volcanoes is important for reducing losses from future eruptions, especially considering that millions of people live close to active volcanoes. Some of the hazards are obvious, such as being overrun by lava flows, being buried by layers of ash, or being hit by hot glowing avalanche clouds known as nuées ardentes. Other hazards are less obvious, such as poisonous gases that can seep out of volcanoes, suffocating people nearby, and changes to global climate as a consequence of large volcanic eruptions. The table "Examples of Volcanic Disasters" lists examples of some of the worst volcanic disasters of the last 200 years. In some types of volcanic eruptions lava may bubble up or effuse from volcanic vents and cracks and flow like thick water across the land surface. During other eruptions lava oozes out more slowly, producing different types of flows with different hazards. Variations in magma composition, temperature, dissolved gas content, surface slope, and other factors lead to the formation of three major types of lava flows: aa, pahoehoe, and block lava. Aas are characterized by rough surfaces of spiny and angular fragments, whereas pahoehoe have smooth ropelike or billowing surfaces. Block lavas have larger fragments than aa flows and are typically formed by stickier, more silicic (quartz rich) lavas than aa and pahoehoe flows. some flows are transitional between these main types or may change from one type to another as surface slopes and flow rates change. It is common to see pahoehoe flows change into aa flows with increasing distance from the volcanic source. ridges, all characterized by nonexplosive eruptions. Virtually the entire islands of the Hawaiian chain are made of a series of lava flows piled high, one on top of the other. Most other volcanic islands are similar, including the Canary Islands in the Atlantic, Reunion in the Indian Ocean, and the Galapagos in the Pacific. In January of 2002, massive lava flows were erupted from Nyiragongo volcano in Congo, devastating the town of Goma and forcing 300,000 people to flee from their homes as the lava advanced through the town. Lava flows generally follow topography, flowing from the volcanic vents downslope in valleys, much as streams or water from a flood would travel. Some lava flows may move as fast as water, up to almost 40 miles per hour (65 km/h), on steep slopes, but most lava flows move considerably slower. More typical rates of movement are about 10 feet (several m) per hour, to 10 feet (3 m) per day for slower flows. These rates of movement of lava allow most people to move out of danger to higher ground, but lava flows are responsible for significant amounts of property damage in places like Hawaii. Lava flows also are known to bury roads, farmlands, and other low-lying areas. It must be kept in mind, however, that the entire Hawaiian island chain was built by lava flows, and the real estate that is being damaged would not even be there if it were not for the lava flows. In general, pahoehoe flows flow the fastest, aa are intermediate, and blocky flows are the slowest. Basaltic lava is extremely hot (typically about 1,900-2,100°F, or 1,000-1,150°C) when it flows across the surface, so when it encounters buildings, trees, and other flammable objects, they typically burst into flame and are destroyed. More silicic lavas may be slightly cooler, typically in the range of 1,550-1,920°F (850-1,050°C). Most lavas will become semisolid and stop flowing at temperatures of around 1,380°F (750°C). Lavas typically cool quickly at first, until a crust or hard skin forms on the flow, then they cool much more slowly. One of the greatest hazards of lava flows is caused by this property of cooling. A lava flow may appear hard, cool, and safe to walk on, yet just below the thin surface may lay a thick layer of molten lava at temperatures of about 1,380°F (750°C). Many people have mistakenly thought it was safe to walk across a recent crusty lava flow, only to plunge through the crust to a fiery death. Thick flows may take years to crystallize and cool, and residents of some volcanic areas have learned to use the heat from flows for heating water and piping it to nearby towns. It is significantly easier to avoid hazardous lava flows than some other volcanic hazards since in most cases it is possible to simply walk away from the hot moving lava. It is generally unwise to build or buy homes in low-lying areas adjacent to volcanoes, as these are the preferential sites for future lava flows to fill. Lava flows have been successfully diverted in a few examples in Hawaii, Iceland, and elsewhere in the world. one of the better ways is to build large barriers of rock and soil to divert the flow from its natural course to a place where it will not damage property. More creative methods have also had limited success: Lava flows have been bombed in Hawaii and Sicily, and spraying large amounts of water on active flows in Hawaii and Iceland has chilled these flows enough to stop their advance into harbors and populated areas.